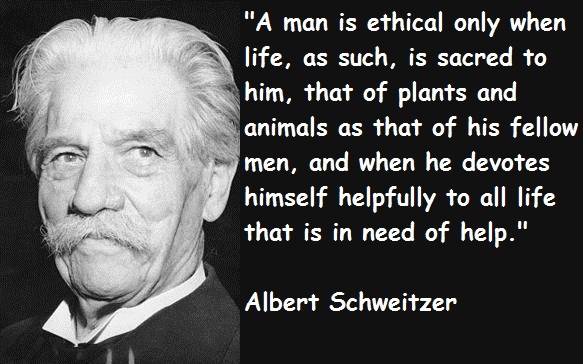 Albert Schweitzer (14 January 1875 – 4 September 1965) was a French-German theologian, organist, philosopher, and physician. He was born in the province of Alsace-Lorraine and although that region had been annexed by the German Empire four years earlier, and remained a German possession until 1918, he considered himself French and wrote mostly in French. This list includes notable Albert Schweitzer quotes on various subjects, many of which are meaningful quotes. 1. Sometimes our light goes out, but is blown again into instant flame by an encounter with another human being. 2. What we call love is in its essence reverence for life. 3. I don&apos;t know what your destiny will be, but one thing I know: the only ones among you who will be really happy are those who will have sought and found how to serve. 4. The purpose of human life is to serve and show compassion and the will to help others. 5. You must not expect anything from others. It&apos;s you, of yourself, of whom you must ask a lot. Only from oneself has one the right to ask everything and anything. This way it&apos;s up to you -- your own choices -- what you get from others remains a present, a gift. 6. In everyone&apos;s life, at some time, our inner fire goes out. It is then burst into flame by an encounter with another human being. We should all be thankful for those people who rekindle the inner spirit. 7. A great secret of success is to go through life as a man who never gets used up. 8. One who gains strength by overcoming obstacles possesses the only strength which can overcome adversity. 9. We cannot understand what happens in the universe. What is glorious in it is united with what is full of horror. What is full of meaning is united to what is senseless. The spirit of the universe is at once creative and destructive — it creates while it destroys and destroys while it creates, and therefore it remains to us a riddle. And we must inevitably resign ourselves to this. 10. Joy, sorrow, tears, lamentation, laughter -- to all these music gives voice, but in such a way that we are transported from the world of unrest to a world of peace, and see reality in a new way, as if we were sitting by a mountain lake and contemplating hills and woods and clouds in the tranquil and fathomless water. 11. The beginning of all spiritual life of any real value is courageous faith in truth. 12. A man can do only what a man can do. But if he does that each day he can sleep at night and do it again the next day. 13. Success is not the key to happiness. Happiness is the key to success. If you love what you are doing, you will be successful. 14. The highest knowledge is to know that we are surrounded by mystery. Neither knowledge nor hope for the future can be the pivot of our life or determine its direction. It is intended to be solely determined by our allowing ourselves to be gripped by the ethical God, who reveals Himself in us, and by our yielding our will to His. 15. Example is not the main thing in influencing others, it is the only thing. 16. You must give some time to your fellow men. Even if it&apos;s a little thing, do something for others - something for which you get no pay but the privilege of doing it. 17. The most difficult thing I have ever had to do is follow the guidance I prayed for. 20. Every patient carries her or his own doctor inside. 21. Grow into your ideals, so that life can never rob you of them. 22. Impart as much as you can of your spiritual being to those who are on the road with you, and accept as something precious what comes back to you from them. 23. Truth has no special time of its own. Its hour is now -- always. 24. There are two means of refuge from the miseries of life: music and cats. 25. By having a reverence for life, we enter into a spiritual relation with the world. By practicing reverence for life we become good, deep, and alive.